If you have and eating disorder like bulimia, and meditation is something you’ve never tried, now you can learn to enjoy the benefits of a mind at peace. Here you can learn techniques to cure your eating disorder with the power of internal focus. Using meditation during eating disorder recovery is just one of the many bulimia self help methods available and different treatments work for different people. Check out all of your options. Be sure to download our eBook filled with bulimia recovery stories to learn what these women found that worked for their recovery. As a former bulimic, one of the most important tools for my healing was guided meditation and prayer. I was able to find a way to communicate with my inner being, my higher self and feel connected to the Universe/God/Source in a way that touched and inspired me. For once in my life I felt calm, at ease and found a greater purpose for my life. Bulimia and meditation seemed to go hand in hand as a way to free myself from my binging and purging urges in the beginning. The more I meditated, the less I felt the need to abuse myself. You don’t have to sit on top of a mountain to meditate, just as you don’t have to enter a church to pray. Meditation and prayer is just another way to say “mindful awareness,” to keep your focus on healing from bulimia. I often meditate while hiking and open my mind to listening for wisdom and guidance from my higher self. As I’ve said, meditating can take many forms. After you learn this one technique, you will attain a level in your mind where you will be able to let go of your eating disorder. The more you practice meditation, the deeper you go within yourself and the easier it will be for you to separate your eating disorder from your inner, higher self. When you have an eating disorder you often can’t separate you from your eating disorder. It’s important to become aware of your thoughts and the difference between a random thought and the listener or observer, who is hearing the thoughts. I’ve heard of thoughts as “thought bubbles.” The observer is the vantage point of us from our higher selves. When we can start to listen to our thoughts from a higher point of view – the higher self – we start to see the randomness that often make up our thoughts. If you’re in the midst of an eating disorder then bulimic or anorexic thoughts can be loud and frequent. This is because the frequency of these thoughts attract more, as is proven by the law of attraction. Meditation is a method where you begin to see you are not your thoughts – you are a higher, spiritual being who is observing and listening to these thoughts. Your eating disorder has become a part of your personality because you’ve been thinking a lot of ED type thoughts. By realizing your true self you will know which thoughts are coming from you and which are coming from your eating disorder. When you start to meditate you will see that your worries and the feelings of guilt go away while you are meditating. The longer you’ve been meditating you will find that they stay away for longer, until one day they are gone for good. When you first wake up in the morning sit on the edge of your bed and set the alarm clock for fifteen minutes in case you fall back to sleep. Close your eyes and focus your gaze upward at a 20-degree angle. You can also focus on your third eye, which is located on your forehead between your eyebrows. Focusing your attention like this is a proven trigger to produce a meditative state in the brain. Slowly start counting backwards from one hundred to one. You should focus just on counting and not on anything else. If you keep your mind totally on counting only you will soon be in a meditative state. If your mind starts to create thought bubbles and you find yourself wandering off into thoughts about your day or your to-do list, just relax and refocus your attention on the countdown. Practice breathing in and out slowly and comfortably while you’re counting down. Do this counting technique at least twice a day in the morning after waking up and at night just before bed. The objective of meditation is to quiet the mind. I’ve found that when my mind is quiet either two things happen. I can feel my inner connection to God/Source in my heart center or I can hear words of wisdom from my spiritual self. When I finish my meditation sessions I feel at peace, relaxed and ready for anything. Meditation doesn’t necessarily help you when you’re in the throws of binging, but the daily practice of meditation will allow you to connect with your higher self on a daily basis – grounding and centering you to face those worries and fears when they come up. Your resolve to face life’s challenges will be stronger than when you had ED. Lately I’ve been using this meditation video and it really helps me feel calm, at peace and energized each day. The key is to do it every day or nearly every day. If you practice this technique for at least 10 days straight you will notice that the obsessive thoughts that make you binge and purge, starve yourself or over-exercise will not bother you as much. You will start to realize that a meditation state is contrary to your obsession with food, anger, worries and guilt. 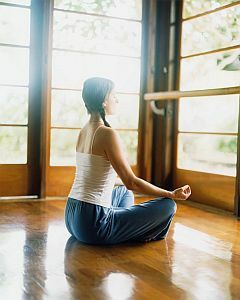 There are many guided meditation methods for eating disorders. This is one simple technique to help with bulimia, but most meditation practices, if practiced with regularity, will help you overcome the urges and bring peace to your mind. By focusing your attention on a simple element like your breath, a flower, a candle, or a positive word or phrase, meditation keeps you in the present. And staying in the present is one of the keys for healing your bulimia. Meditation for bulimia can embrace many techniques, with the objective of calming you down and reinforcing loving intention. By using “mindful awareness” you are connecting and communing with the essence of yourself and the essence of the Universe. This communion takes the focus off your eating disorder as you learn to peacefully concentrate in stillness. Treating addiction with meditation is not religious. You can practice meditation in a variety of ways, be it through sitting still and focusing on one image, or doing breathing exercises (pranayama), yoga, Tai Chi, or Qigong. There are also many forms of meditation study, such as transcendental meditation, which is based on using mantras or repeated phrases you learn from a Master. How often you meditate is really a personal preference. Some would say you should meditate between 30 minutes and up to an hour. Given our busy lives, I think it’s less about how long you spend meditating, but rather the purpose and the releasing you achieve as a part of the process. If you can meditate for 15-20 minutes at least 3 times a week, after 30 days you will begin to see the benefits of a more quiet mind, a more connected sense of self and the well being that abounds. Millions of people around the world meditate every day and couldn’t imagine not meditating daily. Try it for a week and see what works best for you. How do I use prayer for my eating disorder? Nourishing ourselves isn’t just about eating healthy food. It also means nourishing our minds and souls. It was through prayer that I began to have faith in the healing process. By repeating my prayers throughout the day during my bulimia recovery I was nourishing my mind and soul as I learned how to trust so I could transcend my eating disorder. Prayer gave me the courage to change as I let go of my destructive habits. Prayer is used in many recovery protocols, like the 12 step recovery system in Alcoholics Anonymous. When prayer is combined with meditation, you begin to tap into your internal support system to help you recover from bulimia. Eating disorder meditations and prayer helped me resolve my issues with bulimia. I learned how to focus my energy to reduce stress and anxiety to the point where I no longer felt the urge to overeat and purge. Through meditation and prayer my mind became clear and calm and I got my confidence back! Resolving my bulimia with meditation and prayer helped me identify my bigger purpose in life and has brought me the happiness I never had before. Bulimia meditations can be practiced for 15 to 20 minutes at a time. Start slowly as it probably will take several sessions for your mind to slow down. Sometimes your mind will be more active than others. It was about 3 weeks of daily meditation before I started to feel connected and relieved. Be patient and don’t judge yourself if you can’t reach that calm place right away. I promise you, the more you meditate, the easier it gets. The more you do it, the longer you will be able to remain in a calm, meditative state. Bulimia and meditation and prayer is a perfect combination for healing. Add prayer throughout the day when you feel weak or unhappy, and you have a protocol to help you for the rest of your life, even when you’ve recovered. I pray a lot. I don’t always meditate, but when I combine prayer and meditation I find my life unfolds more easily. Remember to download my free eBook to read about how other women found their personal way to recovery. Keep a journal that records the amount of time you spend meditating and praying each day. This will help you stay on track and remind you that bulimia and meditation go hand in hand for healing! Please keep me informed of your progress or share your bulimia story. I’d love to hear from you via email or comment below. Want more help? Click here to sign up now and start receiving my newsletter where I share the latest and greatest coaching techniques for bulimia recovery. Hope this helps. This novel spotlights eating disorders when Ward Keller, president and founder years ago, she had what she calls a brief flirtation with an eating disorder. Please be in touch if I can help you further along your journey.